Much attention has been given to the low level of S&P 500 volatility in 2017, with its annualized standard deviation of 6.7%, the lowest level since 1964. But what also stands out is that this low-risk environment has been accompanied by strong S&P 500 returns—21.8% in 2017. 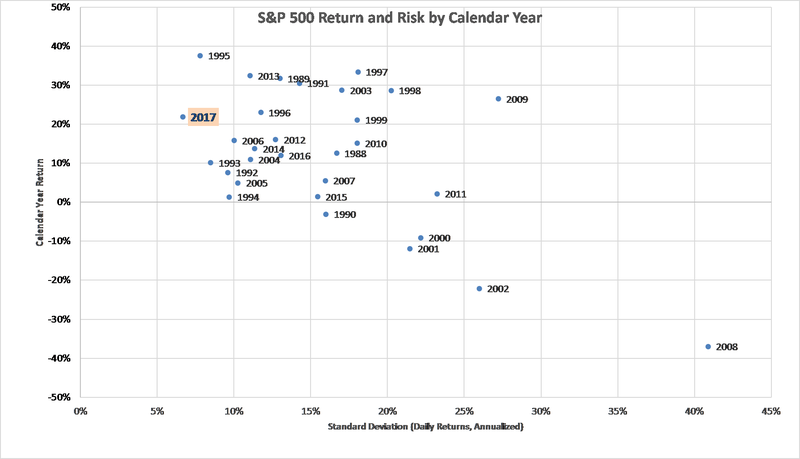 The chart below shows a scatter plot of the total return and risk of the S&P 500 for each of the last 30 calendar years. Over this period, the average calendar-year return was 12.0% and the average standard deviation was 15.9%. This means that in 2017, the S&P 500 delivered almost two times the average return and less than half the average risk. Notice that 2017 was the lowest in terms of risk but among the highest in terms of return over the last three decades. There have been stronger return years, including five years with performance above 30%: 1989, 1991, 1995, 1997, and 2013. However, among these highest return years, only 1995 was a year of low risk. The high return in 1995 represented a rebound from a recession and the low equity market return period of 1992-1994. The most common financial measure that captures the extent to which return is rewarded for risk in the equity market is the Sharpe Ratio, introduced decades ago by Nobel prize winning financial economist William Sharpe. This measure looks at returns relative to risk (standard deviation). It isolates the returns from taking risk by subtracting from the S&P 500 return the returns of a “risk-free” investment in that same period. For most investment strategies evaluated over long periods (e.g. five to-10 years), a Sharpe Ratio of 1.0 is considered to be strong performance. The chart below shows the Sharpe Ratios for each of the last 30 years. With a Sharpe ratio over 3.0, 2017 stands out as unusual in the history of U.S. equity markets. 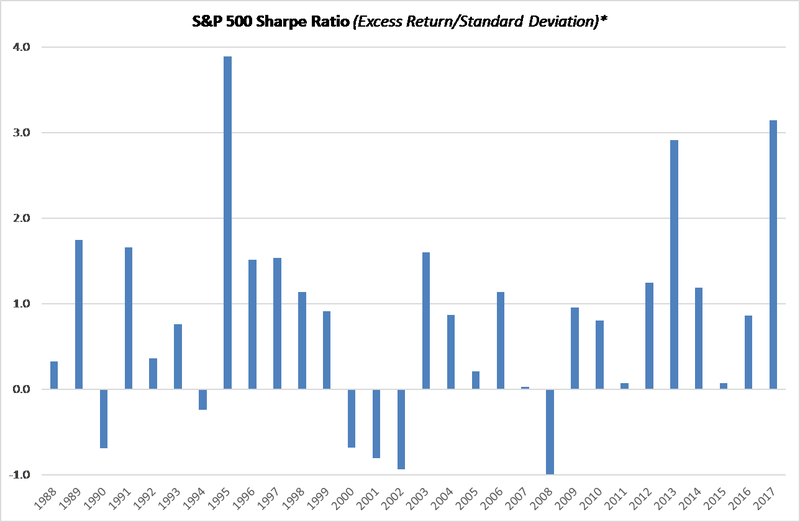 The average calendar-year Sharpe Ratio over the last three decades was 0.82. The only recent year that even came close to 2017 was 2013, when the S&P 500 delivered a 34.4% return with standard deviation of 11.05%, below average but not nearly as low as 2017. * Excess return for each calendar year is calculated as S&P 500 total return minus the yield of a one-year U.S. Treasury Bill at the start of the year. In my opinion, we won’t see a repeat of the outstanding returns relative to risk like we had in 2017. Something has to give. Risk will likely be higher and return lower. The good news is that just because the S&P 500 had very high returns in 2017 does not mean that the next year will deliver below-average returns. If we look at the very high return years of 1995, 1997, 2003, 2009, and 2013, we see that returns for the following calendar years were lower but still solid. That being said, investors should be prepared for more volatility to earn those returns. Strategies consistent with a more moderate return and higher risk U.S. equity environment would be those that have a stronger focus on factors such as quality, dividend growth, and earnings growth combined with value, and that favor lower volatility stocks. Other strategies to consider are those that look to boost income by capturing some of the higher volatility anticipated in 2018 through the sale of options. These options strategies include ones that compensate investors for committing to cap some portion of upside returns (covered-call writing) or to buy equity exposure at lower prices (collateralized put writing). Short-term option premiums tend to adapt quickly to changing volatility of the underlying security or index, so the premiums for covered-call and put selling should be higher as risk moves up. I believe that higher risk is clearly ahead for equity investors. While we have a long way to go to reach even average risk levels (volatility regimes tend to be sticky at low or high levels), a more cautious approach to equity investing is warranted for 2018.